What more can we say? The Language Builder Picture Cards are the premier set of flashcards for any home or school program aimed at developing language skills. 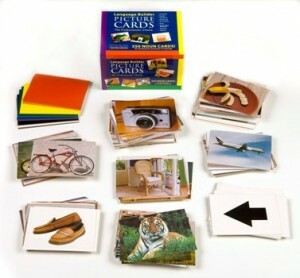 There are 350 beautifully photographed noun cards that take you through teaching and generalizing Animals, Foods, Vehicles, Furniture, Clothing, Toys, Everyday Objects, Shapes and Colors. The Language Builder is the first thing any parent or teacher needs to set up an ABA program and start teaching expressive and receptive language skills. This week only, save 15% on the Language Builder Picture Cards by entering the Promo Code BLOGLB22 at checkout. *Offer expires on December 27, 2011 at 11:59 pm EST. Not compatible with any other offer. Be sure there are no spaces after the Promo Code when you enter it at checkout. Written by: Different Roads to Learning on December 20, 2011. This entry was posted in ABA, autistic spectrum disorder, Difflearn Promo Code, Pick of the Week, Products, Resources, Sale, Speech & Language and tagged ABA, Applied Behavior Analysis, autism, autism education, autistic spectrum disorder, Different Roads to Learning, Early Intervention, Language Builder Picture Noun Cards, language development, learning, Resources, teaching tools by Different Roads to Learning. Bookmark the permalink.